0.75ltr Handmade Teardrop Wine Decanter. The teardrop decanter is modern in appearance and is hand made in lead crystal. 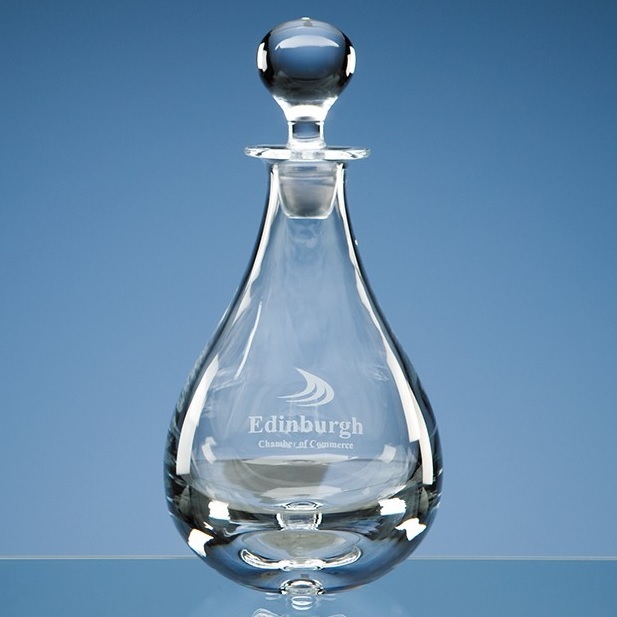 The decanter measures 265mm x 140mm. It weighs 1.6kg unboxed. It can be personalised with any crest, logo or wording to create a gift that is sure to take pride of place when put on display at home or at work. All engraving has an additional charge as shown. Please note that if you are buying more than one item with same logo you only need to upload the logo once. The logo charge is a one-off set up fee. The decanter comes in a skillet box as standard.